“The increase of population …now began to require church extension, and in 1834 the northern part of the parish was provided with a chapel of ease” wrote Riland Bedford, in his History of Sutton Coldfield. Over the next twenty years churches were provided at Walmley and Boldmere, and districts were assigned to them to become their parishes. Sutton was now four parishes instead of one large one, and the exact boundaries of each parish, together with a survey of all the land and property belonging to each was required. A land agent was engaged, and the Sutton Coldfield Parochial Valuation was duly published in 1856. The large-scale plan marking all the buildings and fields was similar to and based on one produced in 1824 for the Corn Rent, and the accompanying schedule similarly gave the names of the owners and occupiers of each unit. The Valuation Schedule gave even more detail, however, particularly about buildings. Referring to the schedule, we find that Plot 2843 on the plan (now 270 Lichfield Road) consisted of a 2-storey house measuring 15 feet by 39 feet, a wheelwright’s shop 46 feet long, and a pigsty. James Hastilow was the owner/occupier, and the rateable value of the buildings was £9/12/-. Two cottages nearby, tenanted by William Barlow and Mrs. Ellis, also two storeys high, measured only 14 feet by 21 feet, with a rateable value of £3/12/-. Many of the labourer’s houses in Sutton were rated at under three pounds, while the tiny toll house on the Tamworth Road at Ashfurlong Corner, also two storeys, measured only 12 feet by 13 feet, rateable value £1/12/-. Eliza Sawyer lived there, she was the toll keeper for the trustees of the Tamworth and Sutton Coldfield Turnpike Road. By contrast, a yeoman farmer, Joseph Dutton of Little Sutton, had a three-storey house occupying a site of 1,800 square feet. His farm buildings consisted of: three “Barn Stable & Cow Houses”, two barns and stables, two wagon houses, two malthouses, two cowhouses, and two old tanhouses, altogether rated at £68. This fell far short of the £166/5/- value of Four Oaks Hall, the hall’s measurements being given as seventy-one feet by eighty-two feet, three storeys high. As for the houses of the gentry, Mr. Perkins, who lived at Moat House, with its four stables and carriage house, had a rateable value of £72, and most of the large houses in High Street were had values of twenty to thirty pounds. There were a number of new villa residences, built for wealthy Birmingham manufacturers, such as Marchmount House in Birmingham Road. It had a greenhouse, barn, carriage house and stable, the three-storey house occupying a 1600- square foot site and a rateable value of £48. The schedule was made at a time of rapid change, and for a few years these changes were noted - change of ownership or tenant, new houses built and old ones pulled down, or property taken for the new railway. It is a source which gives us a comprehensive view of the life of the town in 1856. 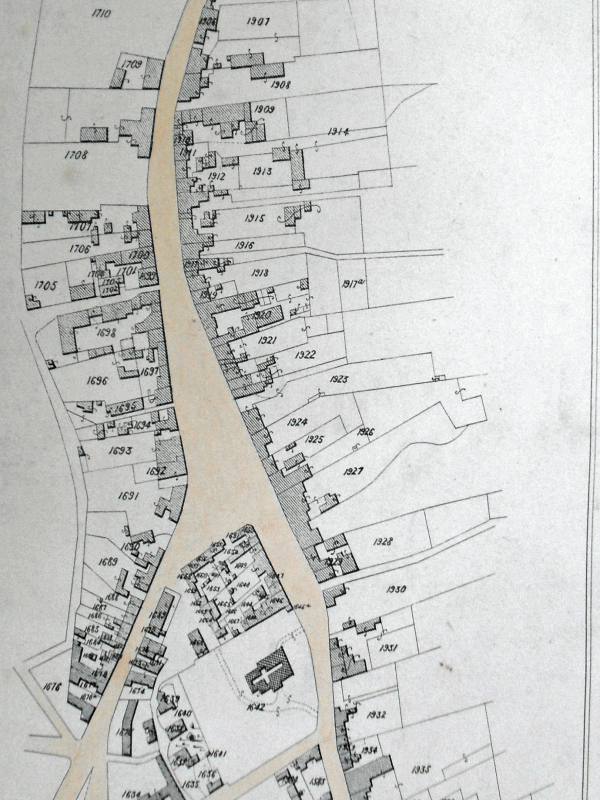 The 1856 Parochial Valuation map includes an enlarged plan of Sutton town centre - this detail shows the junction of High Street with Mill Street and Coleshill Street, and the complex of buildings which stood where Vesey Gardens is now.